Every time I hear a vendor utter words such as “private cloud” or “hybrid cloud”, I see visions of brakes being applied. Usually by vendors or IT departments, who sell (or buy) the concept that they can evolve gradually into the future as prices plummet. I had my first taste of a likely future state a few years back. The London Organising Committee of the Olympic Games needed to provision 500,000 email accounts for a 2 year period, lasting 12 months before and 12 months after the 2012 games. I recall that several prospective suppliers configured branded hardware, software and management using their own hosting plus services, and came out in pricing around £7-10/user/year. Using their existing scale, Google came in at 14p/user/year. It’s the exponential growth part that catches most past suppliers out and that’s due to this expectation of gradual change due to the previous competitive stage (i.e. product vs product). To explain this, I’ll use an analogy from a good friend of mine, Tony Fish. Consider a big hall that can contain a million marbles. 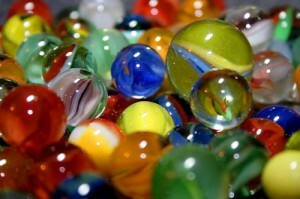 If we start with one marble and double the number of marbles each second, then the entire hall will be filled in 20 seconds. At 19 seconds, the hall will be half full. At 15 seconds only 3% of the hall, a small corner will be full. Despite 15 seconds having passed, only a small corner of the hall is full and we could be forgiven for thinking we have plenty more time to go, certainly vastly more than the fifteen seconds it has taken to fill the small corner. We haven’t. We’ve got five seconds. Hence for a hardware manufacturer who has sold computer products and experienced gradual change for thirty years, it is understandable how they might consider this change to utility services will also happen slowly. They will have huge inertia to the change because of past success, they may view it as just an economic blip due to a recession and their customers will often try to reinforce the past asking for more “enterprise” like services. Worst of all, they will believe they have time to transition, to help customers gradually change, to spend the years building and planning new services and to migrate the organization over to the new models. Alas, Amazon alone is estimated at $2bn in cloud revenue for 2012 and predicted for almost $4bn in 2013. If that growth rate continues then by 2016 they will be in excess of $30 billion in revenue. They also have rapidly growing competitors such as Google. The cold hard reality that many existing suppliers probably don’t comprehend is that the battle will be over in three to four years and for many the time to act has already passed. Like the rapid change in climate temperature in Greenland, our past experience of change does not necessarily represent the future. In industry, we have a long history of such rapid cycles of change and inertia is key to this. These cycles we call “revolutions” as in industrial, mechanical and the revolution of electricity. During these times, change is rapid not gradual and disruption is widespread. I’m typing this post into a WordPress network site I provisioned on a Linux instance in Digital Ocean Amsterdam. It is costing me $10/month for my server instance, 30GB storage and 3TB/month network bandwidth, plus another $2/month for regular backups and and ability to store as many snapshots i’m comfortable with. Digital Ocean, like AWS, are gobbling up capacity at a rate of several thousand new server instances every month, and i’m sure Google and Microsoft Azure aren’t standing still either. Just a relentless tide of predominantly Linux servers that are simple to provision and build applications upon. We are in a time when mobile, the cloud, a deluge of data and collaboration tools – based on open source software – are brewing a perfect storm. Google, Amazon, MongoDB and GitHub will, I’m sure, be there when the dust settles. Who else? ← Has the Apple iPhone 5c really failed?